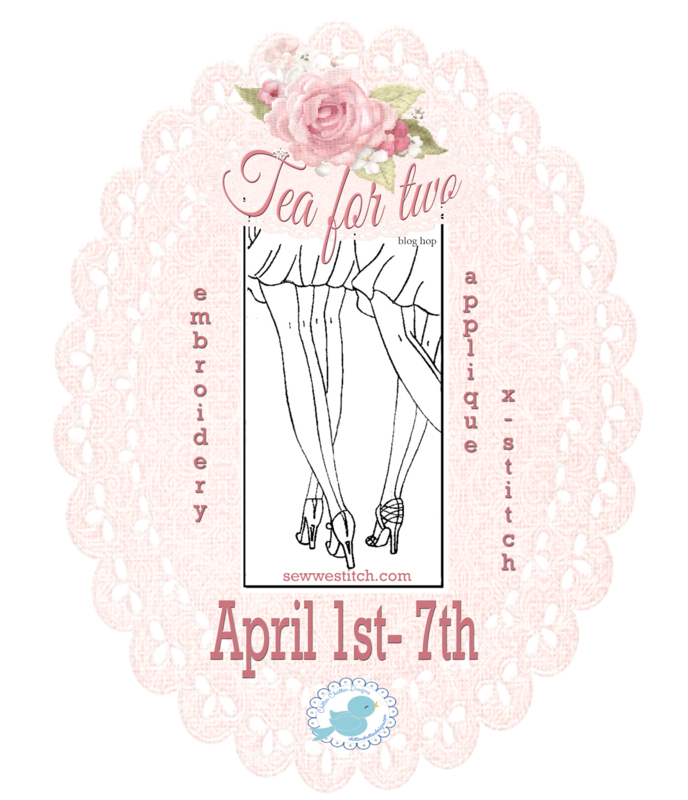 I had a few ideas for bringing the doilies to life again, but one in particular stood out immediately as perfect for 'framing' a sweet little tea pot motif I'm working on for the April Stitchery Club. Here's a sneak peek at that design. 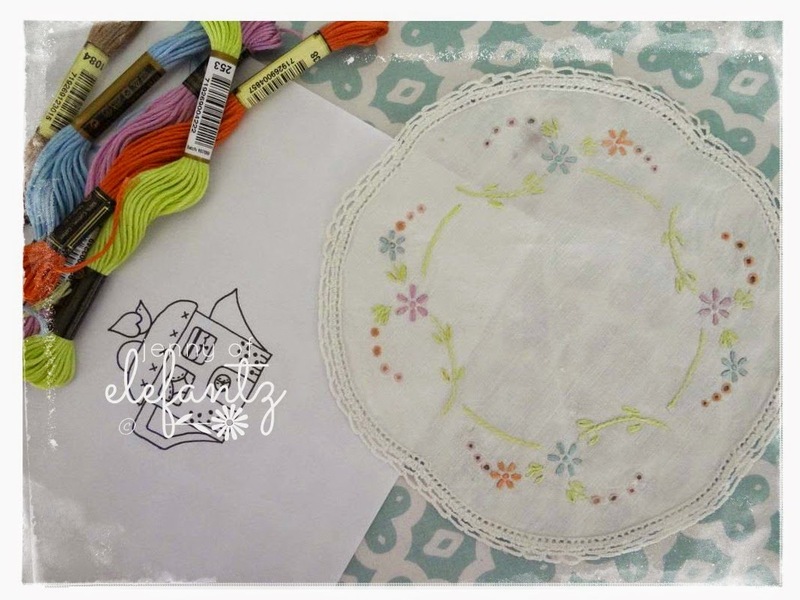 I'll show you how this 'remade' doily will be used next week. 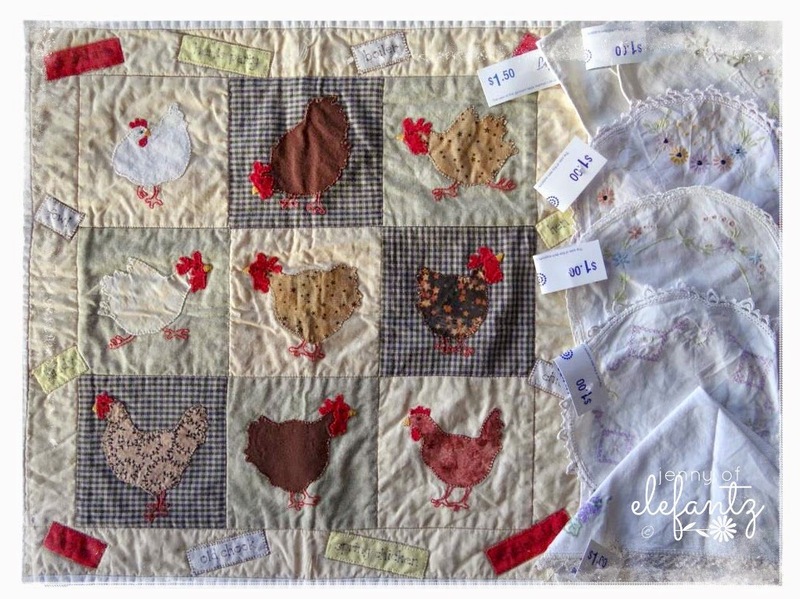 Did you notice the country style appliqued mini quilt with all the chooks?! ...because I know how much time and effort goes into making these projects, so my old/new chicken quilt is going to be cherished in the Elefantz home! Mr E does, I don't. Unless I am after something very specific. Which is what happened recently. 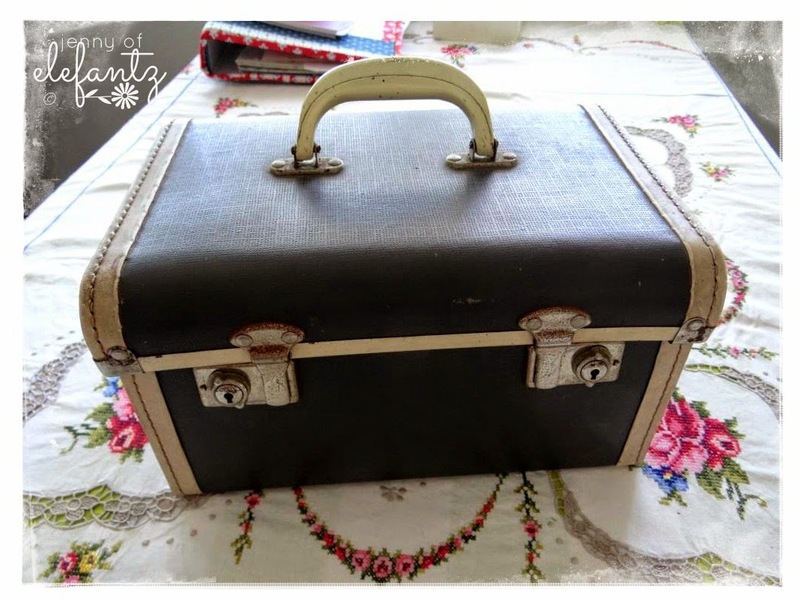 You see I'm planning a few winter makeover projects (if winter ever arrives because we're still sweltering in record temperatures here in the tropics) and something that's been top of my list for a few years now is a small suitcase that can be re-made as a sewing case. 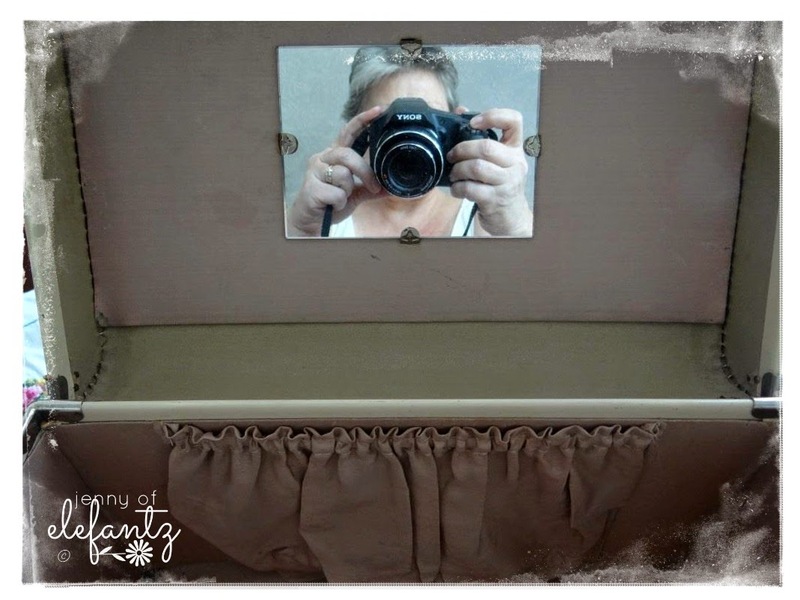 It occurred to me that an old vanity case (beauty case) would be perfect so I typed in 'vanity case' on Ebay and within seconds I had five to choose from. One stood out from the rest, so I placed my $20 bid and prepared to sit and wait out the 9 remaining days of the auction, fully expecting to be swamped by collectors with more money than I could afford. But nobody made a bid against me! 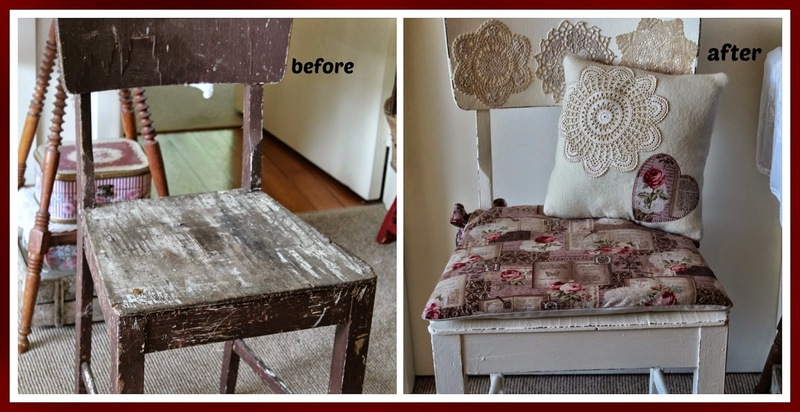 As I am still a novice in restoration and the makeover of delicate old things I asked my talented friend Julie from My Threadbear Life for advice on how best to treat my vintage treasure. 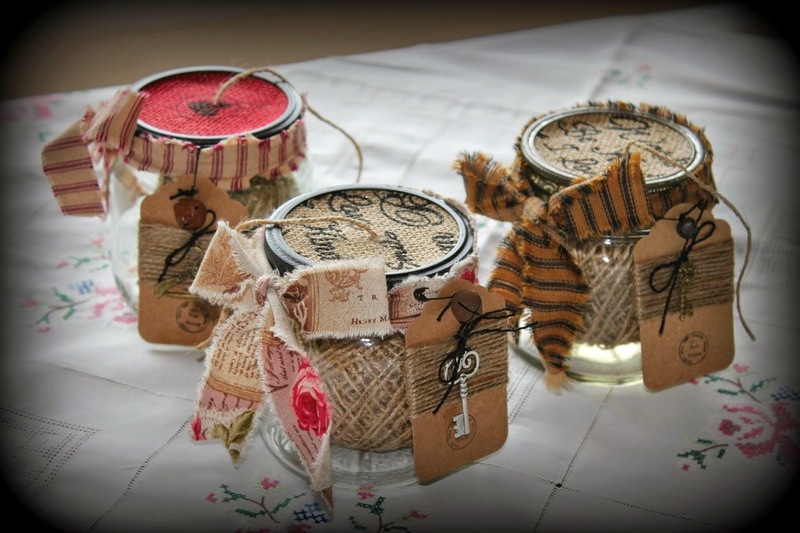 She is the queen of this craft and I often find myself on a Friday night scrolling through her blog to see the beauty she so perfectly creates. It's inspiring and good for the soul. I have gleaned from her sage advice and now have a little more confidence in the correct way to clean the case, which I hope to make a start on after Easter. 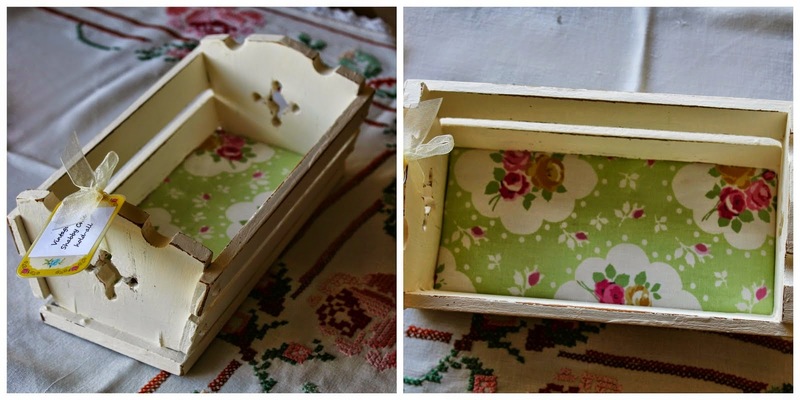 Might also begin sketching some ideas for how I'd like to re-create this as a sewing case in the future.. I did find a few makeover inspirations by searching on Pinterest. Here's a few that tickled my fancy. And what about THIS one for a bit of glam? So many lovelies to find inspiration in, but I have only one little case to play with. Well, I had better do it right because I think this will take a lot of time and creativity...and I'm really looking forward to the challenge. Make sure you visit Julie's blog HERE - seriously, it's one of my favourite online places to visit. In fact, Julie recently used a larger suitcase for something very special. 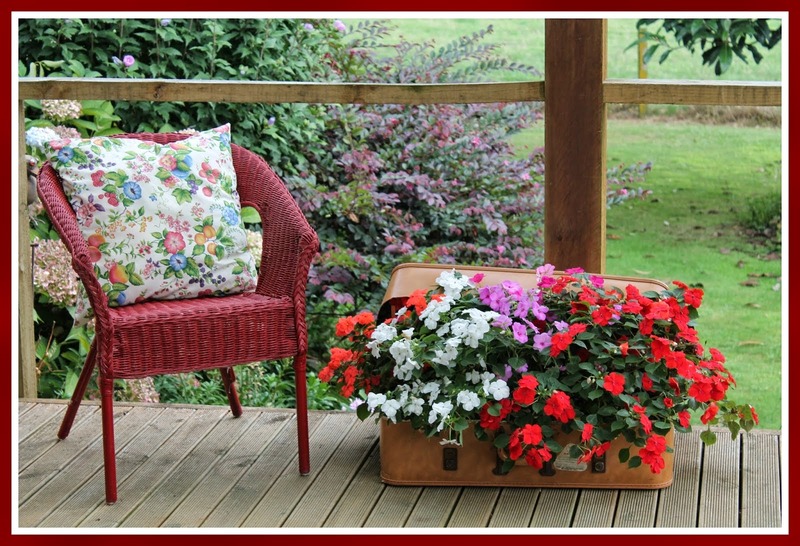 Wouldn't you love to sit on her porch!? I'm taking a few days break from the blog over Easter. Mr E and I are both in need of some R & R so we're heading north for an overnight road trip and have our cameras packed for some off-the-beaten track adventures. Sweet Blossom and her best friend are holding down the fort at home with Bob-the-dog, Princess Sophie & Private Charlie, and we're ever so grateful for that...I'd best bring something nice home as a thank you, right? Gracias por tu comentario en mi blog.He visto el tu blog y tienes cosas muy interesantes.Si me lo permites vas a tener una seguidora más. 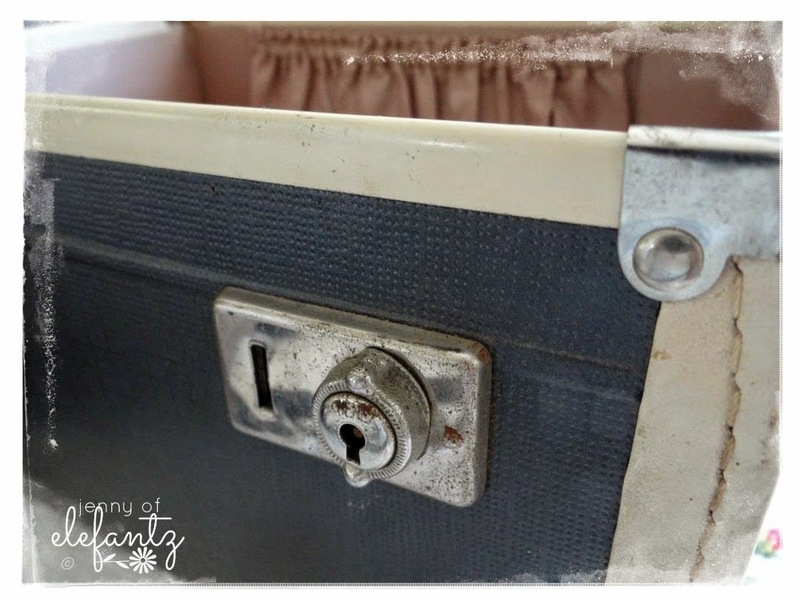 love old suitcases! & am seriously thinking about getting some to store my wool in as i am very disappointed with the plastic tubs i use as they are not air tight! enjoy your holiday break away & look forward to reading your adventures next week! Oh wow, Great finds! I only seem to find vintage linens at the antique stores and of course at that point the are way overpriced. The chickens are too fun. 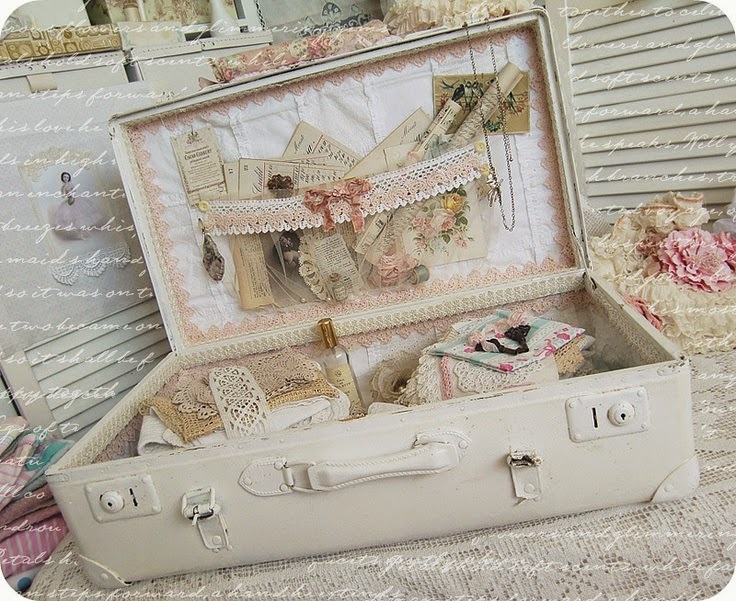 I only go on eBay for specific items too, love the suitcase ideas. Easter Blessings to you and your family. Have a safe and wonderful trip. Can you hear the screams all the way from Canada???? Linens in great shape!!!!! That wee quilt. A suitcase!! (I collect them but they are now so expensive. The one you got would run about $45 Cdn.) You must be pretty pleased. A very peaceful Easter to you. 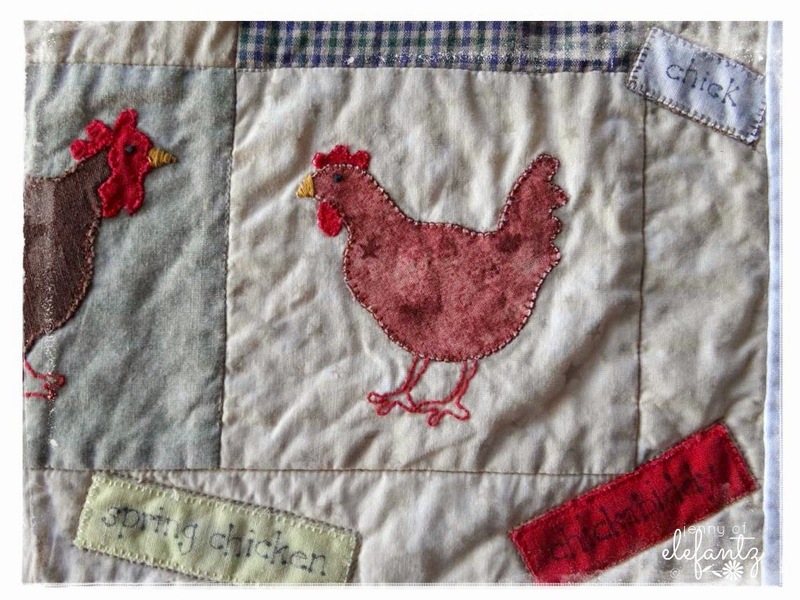 Oh Jenny, your vintage finds are so beautiful - I think that little chicken quilt/applique would've definately had to come home with me. Like you, I always look at all the work in it that someone has done. Last night I dreamt about your little vintage case ... I am sooo excited to see your revamp of it. Thank you SO much dear friend for the kind & generous things you wrote about my blog space. 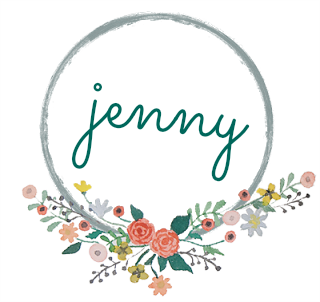 I am so thankful I found you & your blog Jenny. Can't wait to see what you create with this case! I love your Op Shop finds. Like you, I am saddened when I find someone's beautiful hand sewn things. I often wonder if it is from a deceased estate and the family simply don't cherish them as much as we do. I bought a blue and white appliqued hexie cloth a few years ago. I think it was to make a cushion but I am not sure. It is now on my bedside table and sometimes I just drape it over a the cupboard door of my kitchen dresser.I also bought an garden angel doll. I don't really like her that much but I couldn't leave her there. LOL. 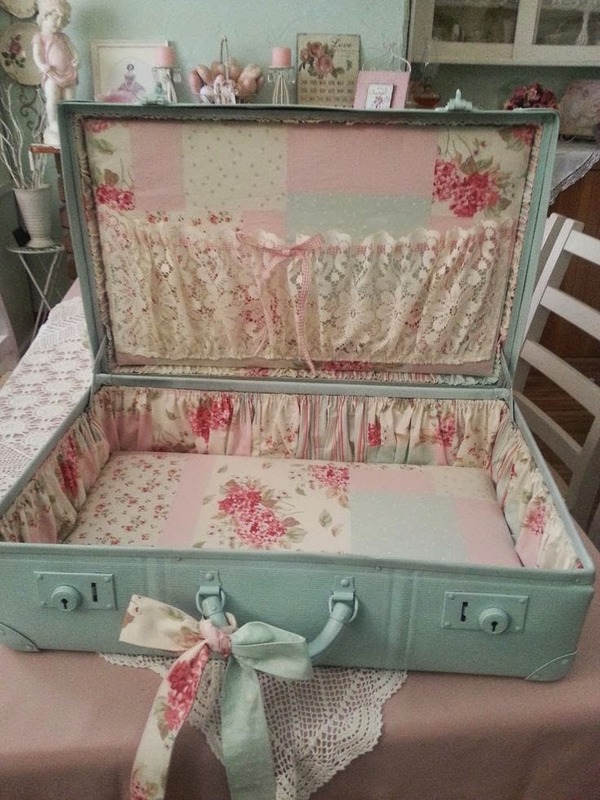 Love the suitcase idea. I still have my kindergarten case and my primary school case. Maybe I should revamp them. I am kicking myself having thrown out a vinyl round deep beauty case I had for many years as a teenager. You have some wonderful ideas as usual. LOve your stitchery on that doily. OOPs! Rather rude of me forgetting to wish you a very Happy Easter. Hope you have a hip hop happy one. What wonderful finds. 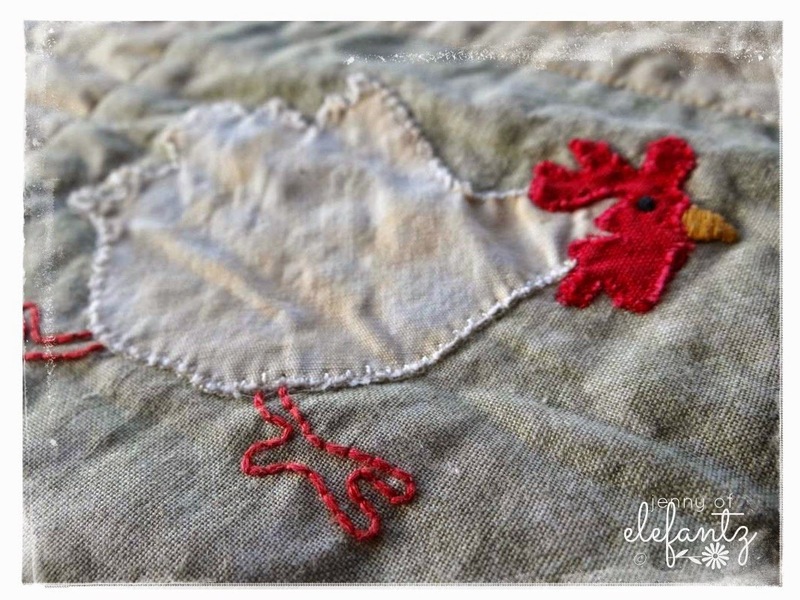 I especially like the little chicken quilt. I have roosters and chickens in my kitchen. I pray that you and Mr. E have a great rest. You will be missed. He Is Risen! He Is Risen Indeed! Thank you again for another inspiring blog post. 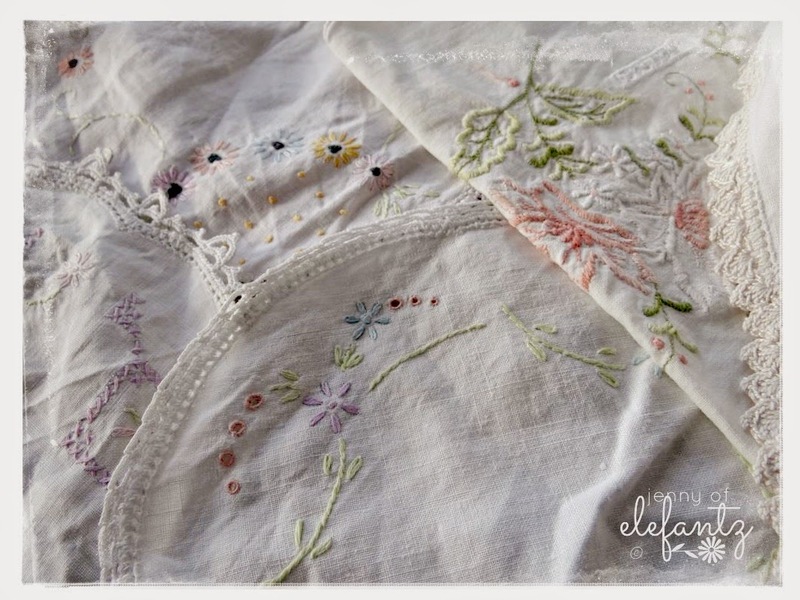 I love old linens and have several that I would love to bring back to life. I also have a small cosmetic case very similar to yours that I have been meaning to transform. I am inspired. Have a wonderful few days of rest. Such wonderful finds! You honor the original needle woman with the care and reverence you show. Those are lovely inspiring photos you found! I love the style! I am wondering how you will get rid your case of the musty smell. As an asthmatic with mold allergies, I am always afraid of those smells. Please keep us posted on your makeovers! Have a blessed Resurrection Day! And enjoy your alone time with your hubby. I'm so glad you got the case. I can already see it in Jenny colors and fabrics. 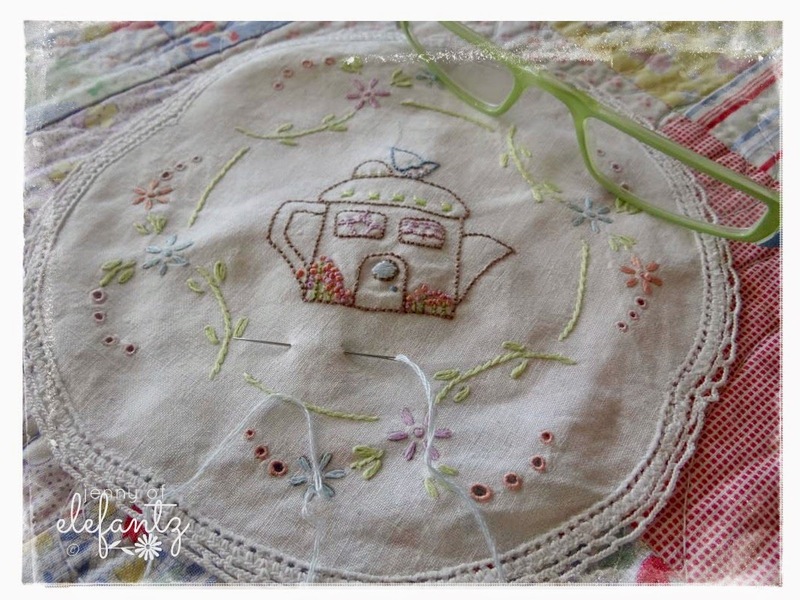 =) I love, love, love what you are doing with that little doily! There's always something wonderful at Jenny's house. ;) Have a marvelous trip and I will be thinking of you on Easter morning, definitely. He lives! Gorgeous treasures that you rescued sweet Jenny. I know you won't get this till you return, but I pray you have a Blessed Easter weekend, what better way to celebrate our Saviors Resurection than to enjoy nature and His glorious creations. God Bless dear friend. "He Is Risen" !!! 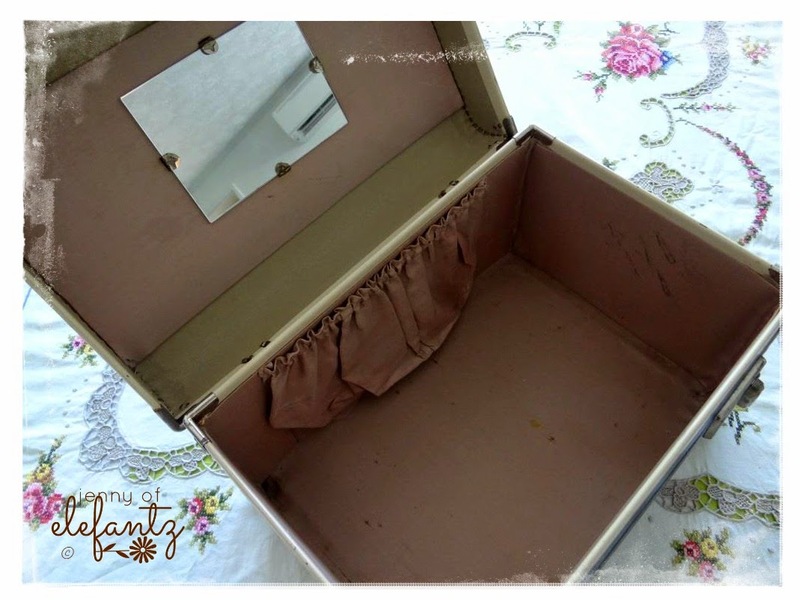 Would you believe my mother owned a make up case just exactly like that!!! She called it that not me. I used it in the 60's for a few overnight trips with my church youth group. I felt so grown up. I wish I could find one and I wouldn't change a thing.